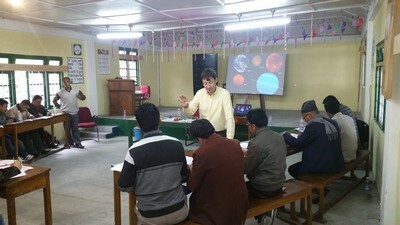 A few weeks ago we ran a set of training workshops for head teachers and teachers of the Mondo Foundation-sponsored schools in Darjeeling District, West Bengal India. These teacher workshops are a very important part of our objective to improve the standards of teaching in the region. Following on from the training workshops held in autumn 2015, these sessions were devised and run by Nico Bashford, Mondo’s experienced trainer who is of UK origin and previously worked at the British Council in the education sphere. For many years now, he had made his home in the beautiful Dooars region of West Bengal and regularly helps us to improve the quality of teaching processes in the region. Last year, Nico’s workshops introduced the teachers to techniques of book creating as an effective method for teachers to involve the children in group work and to bring the syllabus to life by illustrating aspects that might otherwise seem dull – for example, he found a way to make algebraic figures interesting! We started the workshops with a session for head teachers to introduce them to the ideas and gain their feedback. As with all of our projects, we seek to get buy-in from the local community and key stakeholders before expanding and developing them using feedback from the ground. Once we had shaped the workshops to better suit the needs of the schools, we ran the training for all teachers across the 15 Mondo-sponsored schools in the region. The workshops were held in multiple school locations across a period of two weeks. The attendance by teachers from different schools also allowed for the cross-pollination of teaching methods and ideas, and reinforced the Mondo school spirit that runs through the schools we sponsor. We were delighted to hear that both the concept and the workshops themselves were well received! We are now looking to see how best we can follow up with the schools to help them iron out any difficulties with the implementation of the new system and will then approach the teachers again to ask them what other areas they would like training on. If you have experience of teaching and would like to contribute towards childrenâ€™s education in India or Nepal then we have volunteering opportunities for you. Why not visit an incredible community and make a difference while youâ€™re at it? Please get in touchÂ if youâ€™d like to learn more. No doubt we’ll be writing about more teacher training sessions soon!